All general support: help on flying, installation, hardware, getting online etc. There are lots of users and developers to help you out. - does the problem occur with any aircraft, at any airport? - where did you download your aircraft/scenery from? - is there any output printed to the console (black window)? - copy&paste your commandline (tick the "Show commandline box on the last page of FGRun or the "Others" section on the Mac launcher). If you experience FlightGear crashes, please report a bug using the issue tracker (can be also used for feature requests). To run FlightGear on old computers with bad OpenGL support, please take a look at this wiki article. my name is Jonas an downloaded the 2018 version of Flightgear a few days ago. I run a Windows PC on win10. but I really like the Dornier Do X. That was the main reason to download this Program. But there are problems I can't figure out so far. 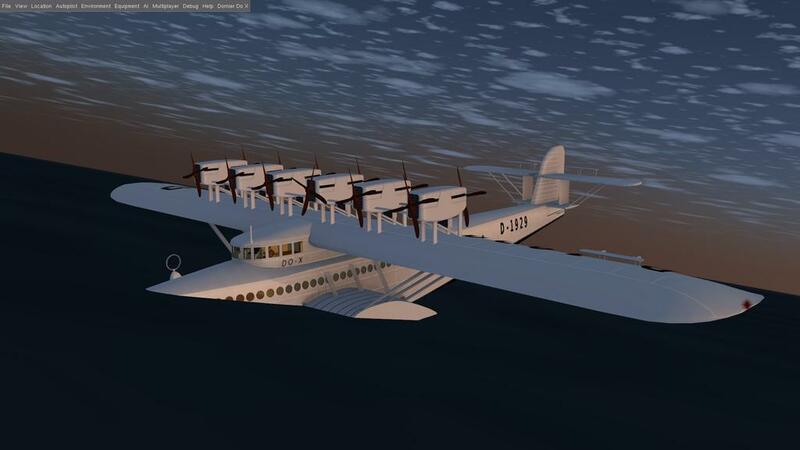 When I load the game with the Do x selected, the aircraft will appear with the nose under water. I can't move any of the levers in the cockpit. When I chose to position the aircraft in the air, then all the controlls are working. when I load the game, the Airport is Honululu. The flying boat then stands on the normal runway, and a window is popping up, if I want to spawn on the nearest seaport which is Pearl Habor. If I klick on "OK" this is whats happens. I tried several locations and seaports. It's always the same. The option to download sceneries automaticly is also switched on. invisble wall. After that I can't move any of the controlls and all the gauges are frozen. Thank you very much for your support. thank you very much for your support. With the correction in the code, she can float perfectly. Starting and landing works fine now. Made a trip with to Do Xfrom Bremen to Helgoland yesterday evening and navigate with and old road book and geometie triagle. I've committed the suggested fix to FGAddon. The plane could use some love in terms of texturing, effects and 3d work, it looks interesting to fly. I also thought about that. But I don't know how to do textures. The Do X is my favorit aircraft in FlightGear and in general. She is not fast, but extremly relaxing to fly and very smooth. Maybe we should open up a new thread in the development section about that idea. It would be so cool to see her with modern textures.